I was at a Christmas party recently sitting at a table between my husband and a man I had never met, a lawyer. I asked him every sort of question and his answers were equally deep and hilarious. I asked him if being a lawyer was his dream job or if he had something else he’d like to do with the next leg of his life. You know there were wild dreams in his heart. He turned the question back to me, quid pro quo. First, let me say that I have something I am working on for the next season of my life when my kids are grown. This question he asked was about the work we do at our house. Do I ever want to not do that anymore. That hit me. I couldn’t imagine a life without hospitality. I looked at him maybe a little too serious and said, “I can’t imagine a life not sitting among the broken.” There is this sacred space that pain brings us to. It’s a rare window when the walls come down and the heart opens up. You don’t find people like that often. In the quiet of the home, I am humbled to be in these moments. The Lord is close to the broken hearted and I want to be too. 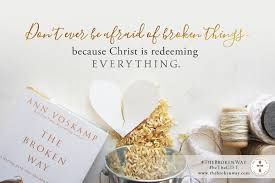 I have been reading Ann Voskamp’s The Broken Way and settled onto the paragraph and read it again and again. Somehow I wonder if it’s in shattered places, with broken people, we are most near the broken heart of Christ. What if we only find our whole selves through this mystery — the mystery of death and resurrection, of brokenness and abundance? Could this be what it means to live in the encircling embrace of communion: broken giving way to abundance — and then abundance, which is broken gives way to an even greater abundance. Why are we afraid of broken things? What if the abundance of communion is only found there in the brokenness of suffering — because suffering is where God lives? Suffering is where God gives the most healing intimacy. Out of the fullness of grace that He has received, He thanks, and breaks, and gives away — and He makes a way for life-giving communion. 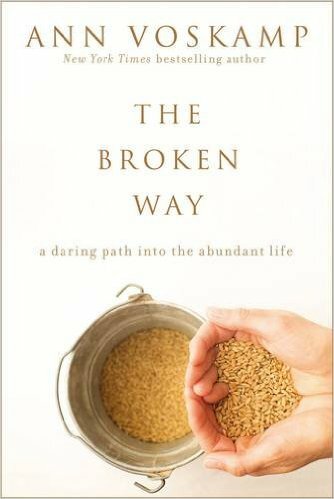 A broken way. I read and kept reading about her learning to let her pain surface so that she can have deep communion with people. Most of us never get there. We never let our soul appear threadbare enough to help anyone that is hurting, I too am learning. I identified with her past of struggling with agoraphobia. I could not even lay out for you the pain I have experienced in this life, but I am learning a lesson. If I thank God for it and lay it out there for others, bitterness erodes and healing begins not just for me, but for the community of women around me that are hiding their pain. Shame is a liar. We are to be co-suffering communities. Like Paul says, "Suffer with me." Teach me how, God. Teach me how to take all of the pain deep within and shape it into a safe place for a heart. This is easily the best book I have read in several years. Buy it. Read it. Listen to it. Learn to share the unique path that you have seen and offer it as a love offering to divine fellowship.